Cycles were first used by the military in the late 19th Century with the introduction of the first ‘improved’ or chain-driven bicycles. The ‘penny-fathing’ bicycle was not really well suited to military use, but the improved bicycle was seen as the ideal mode of transport for infantry soldiers. It could be used for reconnaissance purposes or simply to quickly transfer soldiers from one part of the battlefield to another. Cyclist sections were established in both the regular and volunteer armies. The regimental history of the King’s Own records the establishment of a cyclist section in the 1st Battalion when based in Singapore in 1899. "While at Singapore a party of twelve King’s Own cyclists under Lieutenant Jackson rode from Malacca to Penang, a distance of some 150 miles, they slept at night in rest houses, where they were well looked after by the neighbouring planters." The first record of cycles being used by the Volunteer Battalion is with a photograph of Lieutenant R J Morris at Bowness in August 1888, but a full cyclist section was established by July 1890. As cyclist sections grew in number the bikes developed, brackets were fitted to frames to hold rifles in position and some ambitious plans included multi-wheeled bikes and pull-as-you-pedal machine-gun carriages. The First World War was to have a radical impact with the creation of the Army Cyclist Corps and cyclist battalions saw active service during the war and especially towards the end in 1918 when the Germans began to retreat. The first soldier to be killed in the First World War was a cyclist. Private John Parr of the 4th Battalion Middlesex Regiment was on an evening scouting mission with his bicycle on 21st August 1914 - when he came across the Germans and was shot and killed. Lancaster’s own territorials, the 5th Battalion, King’s Own, had a cyclist section, which was mobilised with the rest of the battalion in August 1914 with the outbreak of the First World War. Private Harry Barrow, from Lune Road, Skerton, was a cyclist in the battalion. He recalled in the 1970s that the battalion had purchased twelve new civilian bikes from a shop in Reading in September 1914, and that from these and those previously held by the battalion only four survived by the 3rd June 1915 after the Second Battle of Ypres. As well as being used to carry messages the cyclists saw action in some of the most bitter fighting of 1915. "My first cycle had the bottom bracket blown out by shell fire" said Harry Barrow, "the four cycles in the photograph are all that survived from September 1915". Left to right, Privates Joe Hesketh, William Thompson, Harold Bedford and Harry Barrow, of the 1st/5th Battalion, King’s Own, photographed by a Belgian photographer at Watou on 3rd June 1915, after the Second Battle of Ypres. 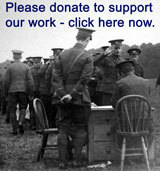 Private Harry Barrow and his three comrades, Joe Hesketh from Fleetwood, Harold Bedford from Cark in Cartmel and William Thompson, who later became the Chief Constable of Lancaster, all survived the war. 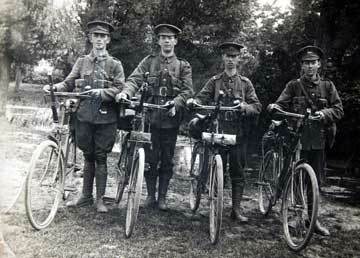 At the end of the First World War the Army Cyclist Corps was disbanded, however individual units retained cyclists. Bicycles were to be again used in the Second World War. They were widely used by British airborne troops and were used on D Day in Normandy and in the advance to Arnhem in September 1944. Many of the cycles used were folding models manufactured by BSA - who were both a well known arms and cycle company, BSA standing for ‘Birmingham Small Arms’. The 8th Battalion, King’s Own, also used bicycles in the Second World War - not only did the cycles provide great mobility when the battalion was on Malta motor transport was almost non-existent because of the shortage of fuel caused by the German blockade of the island in 1942. The fuel that could get into the island had more pressing uses and the soldiers had to depend on leg power. Cycles are still used in the army today, but mainly for adventure training or allowing soldiers to move around large camps and bases, but no longer in conflict with a dependence on armoured vehicles.